I want to share some information on unit prices and how to use them to save money at the grocery store. The cost of one unit of an item. This is almost always* 100 grams for foods. How to calculate a unit price if it isn’t on the price tag? Quantity generally refers to weight and is often in grams but can also be litres, millilitres, kilograms, sheets etc. Usually the unit price is on the tag at the grocery store, however, some grocery chains do not include these prices and you’ll have to calculate the unit cost yourself (in which case I recommend you read my tips) or find another grocery store that does this for you if possible. *You can choose paper towel, fabric softener and toilet paper based on cost per sheet. You can also purchase beverages based on a cost per 100ml. **The best buy is not always the most affordable. If you are on a tight budget sometimes the lowest unit price is from the largest amount of food which can sometimes cost more. (Example: Ten pounds of oats will cost more than two pounds but the unit price is lower so every bowl of oats from the bigger bag will cost less than what comes from the small bag) It is also important to think about home storage for these items. Ask yourself: Can I eat it all? Can I afford it? Can I store what I don’t eat? Will it go bad before I can eat it? Can I freeze it or split the purchase with a friend? The next example is more complex, A is in grams and B is in kilograms. You have the unit price in the same terms in order to assess the better price. Some people can do it mentally without calculating all the steps but I’ve broken it down a little more for those who are doing this for the first time. Oat cereal A 750 grams for $4.77= $0.00636 (that’s confusing! But it makes sense. Think each gram costs less than 1 cent, we can double check this math. Take 477 cents (instead of $4.77) and divide it by 750 grams and you’ll get $0.636 which is the price of 100 grams. 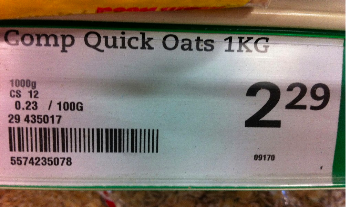 Does 63 cents for 100 grams of oats make more sense? Yes! Especially when its $4.77 for 7.5 servings of 100 grams. Oat cereal B 5 kg for $8.35= 8.35/5=1.67 So it is $1.67 for 1 kilogram of oats and 1 kilogram is 1000 grams, therefore, it costs $1.67 for 1000 grams of Oats and $0.16 (16 cents) for 100 grams. We did this by dividing by 10 to go from 1000 grams to 100 grams. 2. Start unit pricing with less than five items at the grocery store. This will take less time than your full grocery order. Each grocery trip check a few new items and you’ll be a pro at comparing food costs and saving money in just a few grocery trips! 4. You can try a unit price calculator online (bookmark it to your cellphone) or try downloading an app. At is time there are a few app options but I personally haven’t tried any of them so I don’t have one to recommend. If anyone has tried some feel free to share your feedback in a comment for others. 5. Ensure you have an app for understand basic conversions from grams to kilograms and millilitres to litres etc. Previous Post When life hands you lemons… Put them in the Juicer?? Next Post Smoothies, do I or don’t I?